HomeBooks by SubjectActivity BooksBirthday Party in a Book! Birthday Party in a Book! In honor of my husband’s birthday, I just have to share with you these two go-to books that provide (almost) instant, fool-proof birthday party action. Actually, I’ve been known to bring out these books just for kicks. Pubisher’s synopsis: Face Painting has become a touchstone of Klutz appeal and quality. With 1.5 million copies sold, we thought nothing could surpass it — until now. This new edition has been completely revitalized, including new paints in bold, bright colors and easy-to-use tear-out cheat sheets. It’s the book that will launch a zillion more faces. Publisher’s synopsis: Balloon twisting is one of those impossible skills that turn out to be not so impossible after all. It’s downright easy, as a matter of fact. You just need the right materials, the right projects and the right teacher. Who better than the folks that brought you Face Painting? We consulted with several balloon twisting professionals (a bunch of clowns, if you want the truth) and narrowed their repertoires down to the ten coolest projects ever. These aren’t the same old static sculptures everyone’s seen a million times, but rather toys, hats, props and costume pieces that inspire imaginative play. Fairy wings, Viking helmets, magic wands… they’re all here, and they are all amazingly simple to make. 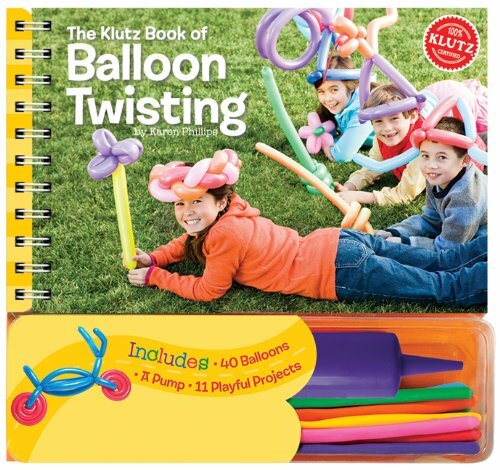 40 balloons in 8 colors give you plenty of practice material, and the included balloon pump is a life-saver. Like painting faces, twisting balloons makes you a hero, at least for an afternoon. There’s nothing more gratifying than hearing a kid breathe “”…awesome…”” while watching you do something. It’s a rare thrill, and it’s your free gift with every purchase of Balloon Twisting.